An antibody is a protein complex used by the immune system to identify and neutralize foreign objects like bacteria and viruses. Each antibody recognizes a specific antigen unique to its target. Antibodies are glycoproteins found in the blood and tissue fluids, as well as many secretions, and are structurally referred to as immunoglobulins, as they are globulins (in the ³-region of protein electrophoresis). Antibodies are synthesized and secreted by B cells of the immune system, which are activated upon binding to substances in the body that are recognized as foreign antigens. 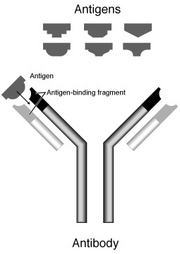 The forked end of the "Y" shaped antibody is known as the variable binding domain. The stem is the constant binding domain. The variable binding domain (Fab) binds to antigens that elicited their production, while the constant binding domain (Fc) finds to various receptors and other proteins of the immune system. Immunoglobulins are heavy plasma proteins, often with added sugar chains (see glycosylation) on N-terminal (all antibodies) and occasionally O-terminal (IgA1 and IgD) aminoacid residues. A crude estimation of immunoglobulin levels can be made by protein electrophoresis. Here the plasma proteins are separated into albumin, alpha-globulins (1 and 2), beta-globulins (1 and 2) and gamma-globulins according to weight. Immunoglobulins are all in the gamma region. In some disease states (myeloma) a very high concentration of one particular protein will show up as a monoclonal band. Immunoglobulins are grouped into five classes or isotypes: IgG, IgA, IgM, IgD, and IgE. Differences in the heavy chain constant domains of the immunoglobulin determine its function and which of the following five classes it belongs to. Other immune cells partner with antibodies to eliminate pathogens depending on which IgG, IgA, IgM, IgD, and IgE constant binding domain receptors it can express on its surface. IgG is an immunoglobulin that is present in normal blood and is the most abundant. This immunglobulin can bind to many kinds of pathogens, for example viruses, bacteria, and fungi. There are 4 subclasses: IgG1 (66%), IgG2 (23%), IgG3 (7%) and IgG4 (4%). IgA represent about 15 to 20% of immunoglobulins in the blood although it is primarily secreted across the mucosal tract into the stomach and intestines. It is also found in maternal milk, tears and saliva. This immunoglobulin helps to fight against pathogens that contact the body surface, ingested, or inhaled. It exists in two forms, IgA1 (90%) and IgA2 (10%). IgM forms polymers where multiple immunoglobulins are covalently linked together, usually as a pentamer and a hexamer. A small peptide known as the J chain is attached to most pentamers, while hexamers do not possess the J chain due to space constraints in the complex. Due to its polymeric nature, IgM possesses high avidity, and is particularly effective at complement activation. IgD makes up about 1% in the plasma membranes in B-lymphocytes. These immunoglobulins are probably involved in the development of differentiated B-lymphocytes into plasma and memory cells. IgE is an immunoglobulin that can be found on the surface of the plasma membrane of basophils and mast cells of connective tissue. IgE plays a role in hypersensitivity and the defense of parasites such as worms. To protect itself from any possible antigen, the immune system produces millions of antibody epitopes, each differing in the variable portion that detects and attaches to an antigen. If each type of antibody required a separate gene to achieve this diversity, the immune system would require many more genes than exist in the genome. Instead, as Susumu Tonegawa showed in 1976, portions of the genome in B lymphocytes can recombine to form all the variation seen in the antibodies. Tonegawa won the Nobel Prize in Physiology or Medicine in 1987 for his discovery. Antibodies exist free floating through the bloodstream as part of the humoral immune system. Antibodies exist in clonal lines that are specific to only one antigen, e.g., a virus hull protein. In binding to such antigens, they can cause agglutination and precipitation of antibody-antigen products prime for phagocytosis by macrophages, block viral receptors and stimulate other immune responses such as the complement pathway. Antibodies that recognize viruses can block these directly by their sheer size. The virus will be unable to dock to a cell and infect it, hindered by the antibody. Antibodies that recognize bacteria mark them for ingestion by macrophages. Together with the plasma component complement, antibodies can kill bacteria directly. The way that antibodies work is by binding with the specific antigen for which the antibody is "designed". This formation of the antigen-antibody results in the stimulation of phagocytosis which is a procedure that cells engulf and destroy particles. An example of an antigen the can do this process is IgG antibodies that prevents the toxin harming the cell by sticking to the cell to destroy it. Antibodies are less effective if they are in low concentrations meaning that it's sometimes less effective in taking care of an already established infection such as viral infections. A viral infection can hide from an antibody so that it does not destroy it when it enters the cell but with bacterial infections they can be destroyed because they are outside of the cell. Antibodies are effective in preventing any foreign antigens that go into the body. If an antibody can't take care of an already existing infection then it could be very effective in preventing an infection that is about to begin its process in targeting the cells. When a macrophage ingests a pathogen, it attaches parts of its proteins to a class II MHC protein. This complex is moved to the outside of the cell membrane, where it can be recognized by a T lymphocyte, which compares it to similar structures on the cell membrane of a B lymphocyte. If it finds a matching pair, the T lymphocyte activates the B lymphocyte, which starts producing antibodies. A B lymphocyte can only produce antibodies against the structure it presents on its surface. Detection of particular antibodies is a very common form of medical diagnostics. Serology depends on these menthods. Autoimmune disorders can often be traced to antibodies that bind the body's own epitopes; many can be detected through blood tests. "Designed" monoclonal antibody therapy is already being employed in a number of diseases (including rheumatoid arthritis) and in some forms of cancer. Presently, many antibody-related therapies are undergoing extensive clinical trials for use in practice. In biochemistry, antibodies are used for immunological identification of proteins, using the Western blot method. A similar technique is used in ELISPOT and ELISA assays, in which detection antibodies are used to detect cell secretions such as cytokines or antibodies. Antibodies are also used to separate proteins (and anything bound to them) from the other molecules in a cell lysate. These purified antibodies are often produced by injecting the antigen into a small mammal, such as a mouse or rabbit. Blood isolated from these animals contains polyclonal antibodies -- multiple antibodies that stick to the same antigen. If the lymphocytes that produce the antibodies can be isolated and immortalized, then a monoclonal antibody can be obtained. Monoclonal antibodies have much greater specificity than polyclonal antibodies.